Failure to do so may prevent the pedals from being depressed properly, may block the driver's vision, or may result in items hitting the driver or passengers, possibly causing an accident. Do not stack cargo and luggage in the luggage compartment higher than the seatbacks. Never allow anyone to ride in the luggage compartment. It is not designed for passengers. They should ride in their seats with their seat belts properly fastened. Even if the total load of occupant's weight and the cargo load is less than the total load capacity, do not apply the load unevenly. Improper loading may cause deterioration of steering or braking control which may cause death or serious injury. 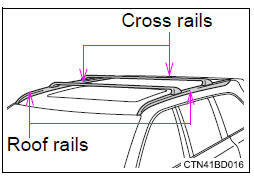 To use the roof rails as a roof luggage carrier, you must fit the roof rails with two or more genuine toyota cross rails or their equivalent. Loading cargo on the roof luggage carrier will make the center of the vehicle gravity higher. Avoid high speeds, sudden starts, sharp turns, sudden braking or abrupt maneuvers, otherwise it may result in loss of control or vehicle rollover due to failure to operate this vehicle correctly and result in death or serious injury. Do not exceed 165 lb. (75 Kg) cargo weight on the roof luggage carrier. Make sure the cross bars are installed securely by pushing them forward and rearward. Failure to do so may cause an unexpected accident. Be careful not to scratch the surface of the moon roof or panoramic moon roof.